Franki Foundations have been involved in an urban redevelopment project in the lower town area of Charleroi city centre, Belgium with a contract value of €9,000,000. 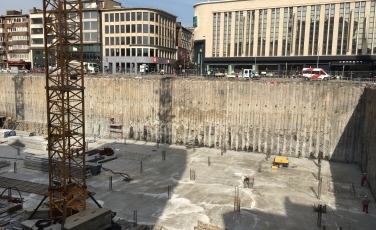 Sub-contracted by Saint-Lambert Promotion SA, the Franki Foundations team have been hired for coordination and execution of deep foundation activities and preparatory and earth-moving works for the construction of a shopping centre (35.000 m²), a 4-star hotel with 100 rooms, residential housing (ca. 50 apartments) and a car park with 900 spaces. Having started work on 1st August 2015, the teams brief included the installation of a 1.200 m long retaining wall constituted of secant piles for the construction of a three storey car park with 2 levels of anchors, 1.200 ground anchors using self-drilling technique and 1.000 micropiles under raft for upward water pressure and earth-moving works. Franki Foundation reported that their biggest project challenges included the coordination of intense co-activity on site. With up to 8 piling/anchor rigs and 10 excavators on site together with the drilling of secant piles into schist rock using the twin rotary-drive technique, strong communication within teams was paramount for the smooth running of the project.